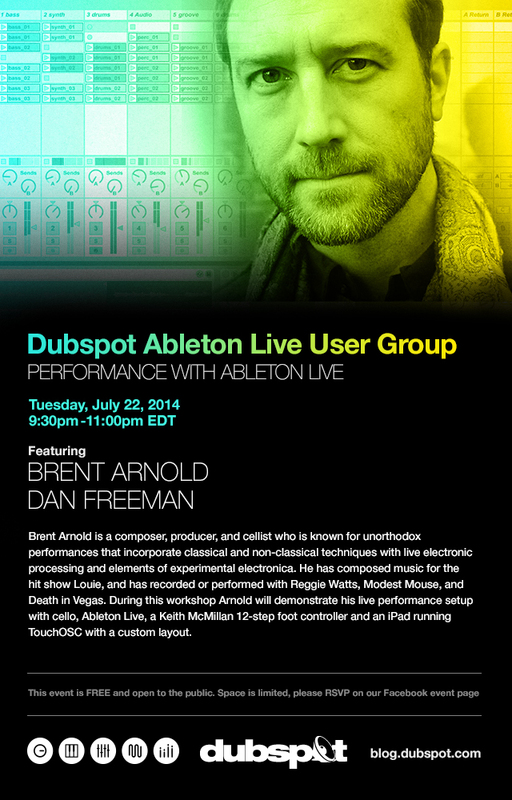 Our Dubspot Ableton User Group continues on Tuesday July 22nd with a live set demonstration from composer, cellist, producer and Dubspot instructor, Brent Arnold. Brent Arnold is a composer, producer, and cellist. His eclectic, cinematic approach is distinctive in his solo performances, his film scores, and his productions for other artists. His wildly unorthodox cello playing incorporates classical and non-classical techniques, live electronic processing, and elements of experimental electronica, rock, improvisation, and Arabic and African music. He composed the cello music for Louis C.K.’s tv show Louie, as well as numerous films and shorts and has recorded or performed with Reggie Watts, DJ/Rupture, Filastine, Modest Mouse, Death in Vegas, Eyvind Kang, and Jherek Bischoff, among many others.